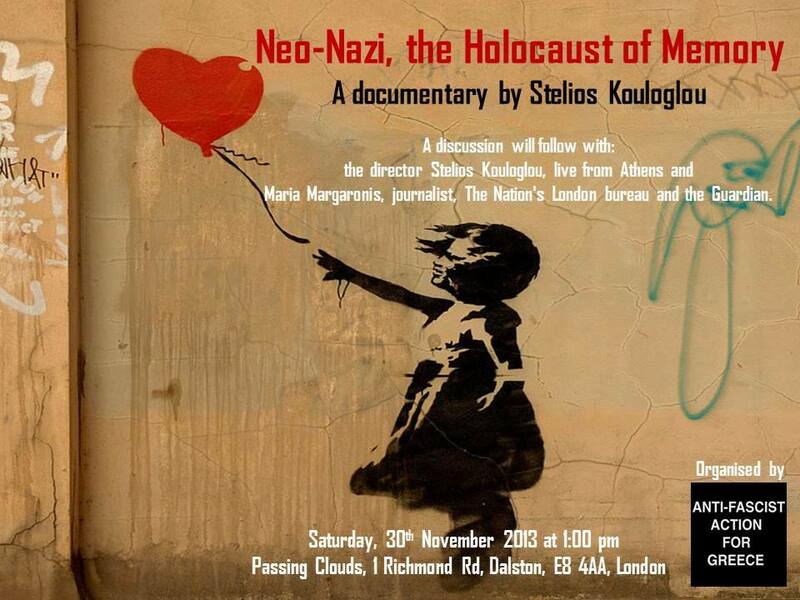 Please come along to Passing Clouds,Dalston, London, on Saturday 30 November at 13.00 for the screening of Stelios Kouloglou’s ‘Neo-Nazi: The Holocaust of Memory’. Neo-Nazi: The Holocaust of Memory is a “documentary within a documentary about memory and oblivion”. It explores historical truth in current Greece, through the eyes of students of a school in the Greek village Distomo. The film provides shocking evidence of the atrocities that took place in two Greek villages perpetrated by the German nazi army and their Greek collaborators who want to take revenge for the defeat of Nazism, 70 years ago. It revisits Greece’s path from German occupation during World War II to the rise of Golden Dawn, an extreme right party. The documentary shows that young people in Greece seem to be unfamiliar with this subject and suggests that this ignorance is related with the growth of Golden Dawn. Maria Margaronis, journalist, The Nation’s London bureau and the Guardian. Donations to the AAfG fund to finance future action would be greatly appreciated. Do arrive promptly for a 13.00 start.